Dental implants have a very high success rate of more than 95%, which is why they are both a wonderful investment and also the preferred replacement option for eligible candidates. Sometimes dental implants do fail, however. It can feel like a disaster if it happens to you, but knowing who to turn to for implant salvation can make all the difference. A prosthodontist and periodontist are the dream team for rescuing dental implants in Jacksonville. 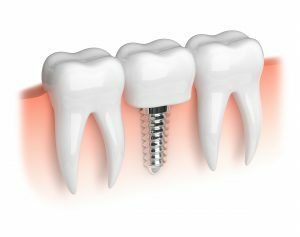 A dental implant may fail in the months after placement due to a problem with placement or an infection that developed right after the procedure. Trusting an implant specialist for placement can help to avoid these immediate dental implant failures. Over the long-term, poor dental hygiene is the chief cause of problems with dental implants. When proper brushing and flossing are not maintained, an infection and the condition known as peri-implantitis can occur. This causes inflammation around the implant post, which will gradually eat away at the jaw bone and cause the dental implant to get loose and fall out if an intervention is not administered. If you have a loose or bothersome dental implant, seeing a specialist right away can help to rescue the post to help you enjoy your investment for the long-haul. Prosthodontists specialize in restoring the smile after tooth loss, including with dental implants. When it comes time for implant salvation, they may work together with a periodontist, a gum and dental implant specialist, for complete implant dentistry care. Dental implant salvation may require removing the implant post and cleaning around it to remove the infection and promote healing. If the dental implant is failing due to bone loss, a bone graft may help to increase the volume of the area to provide the post with a strong foundation once again. Take extra care to clean regularly around the base of the dental implant in case of infection. Do not wiggle the crown, as this can accelerate the rate of bone loss. Take an over-the-counter pain medication as directed to ease discomfort that may be caused as a result of the infection or injury. Stick to a soft-foods diet or chew on the other side of your mouth until you have the problem seen about. To conclude, dental implant failure is rare BUT possible. And, thanks to dental implant salvation, it doesn’t mean the end of your investment! The Jacksonville Dental Specialists are a prosthodontist and periodontist offering high-quality dental implant care from their state-of-the-art office. If you are concerned about dental implant failure, salvation is likely possible. Do not hesitate to get in touch with them by calling 904-323-0928 today!